As of 12:01 a.m. on February 15, the commercial Easter season has been upon us. Chocolate hearts turned into bunnies overnight, and the Peeps are out in force on grocery store shelves. The Easter Bunny is set up for photo ops in every shopping mall, and plastic eggs and that weird plastic grassy stuff is everywhere. 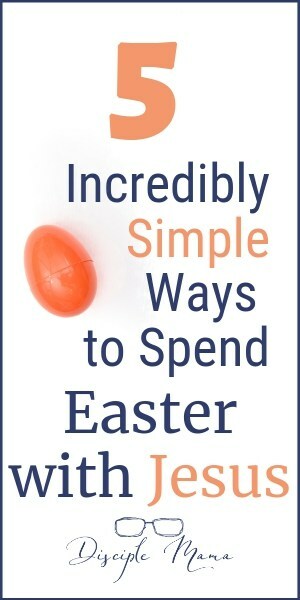 I like Cadbury eggs as much as anyone does, peanut butter eggs and jordan almonds are great, and chocolate is one of the great loves of my life–but so much more than any of those things, this year, I want to have Easter with Jesus. Easter wasn’t heavily emphasized in my church, growing up. We keep the 7th day Sabbath, so we’re not in church on Sunday, anyway, and I can only remember one time that anyone mentioned having a sunrise service for Easter (it’s cold on the beach in April in New England) and I don’t think my parents took us. Some of my friends had Easter egg hunts at home, some of us received Easter baskets, and that was about it. The thing is, that we talked about Easter a lot. Not the holiday, but what it actually represents to Christians–Jesus’ death and resurrection. We heard the story of Christ’s triumphal entry into Jerusalem. The story of the last supper. We observed our parents regularly taking part in communion, and when we were old enough to understand, we participated, too. We washed each other’s feet, and reflected on His selfless service, and recommitted our hearts to Him. We learned from infancy that Jesus died for us, to save us from our sins. But, we learned that the story didn’t end there. He also rose from the grave in victory over death, His triumph over sin complete (though the battle rages on here on Earth, the war is already won). And really, that’s what I want my kids to know about Easter. I want the day to be a special reminder that God loved us enough to allow His Son to come here, live a difficult, but sinless, life and die a painful death condemned by our wrongs even in His perfection. I want my sons to understand that just as we have the free will to choose self over God and be sinful, Jesus used His free will to choose to be crucified for us. And, even more important, that He rose again and will come back someday soon to take us home to be with Him forever. This post contains affiliate links, and as an Amazon Associate I earn from qualifying purchases. I only recommend products I have used and enjoyed, unless otherwise specifically stated. Christmas music is something that I absolutely love (and am pretty strict about only listening to between Thanksgiving and New Year’s Day), but Easter music really wasn’t something I’d ever thought too much about (other than the Hallelujah Chorus). But, music reaches people in a really unique way, and has a way of sticking with us, so this year I found some Easter music for kids into a playlist on Amazon Music (you can use it free with your Amazon Prime account, or get a free trial here) for my boys. We’ve been listening to it for almost a month now. It’s been fun hearing my kids humming or singing some of these Easter-themed songs as they’re playing or going about their days. What more could I ask for than to have my sons singing about how Jesus washed their sins away, or that He’s alive?! Having that kid-friendly Easter playlist around has really opened up some conversations with my 3 year old about the Crucifixion and Resurrection that I’m not sure we would have had otherwise. And He’s been preaching the messages from some of the songs in his (almost) daily “church services” that he puts on for his brother, dad, and I. So, try putting together some Easter music to get the kids focused on Christ this Easter. Have you heard of resurrection eggs? Resurrection eggs are little eggs that each hold a little something that helps you tell the story of Christ’s death and resurrection. Sets are available on Amazon and in many Christian book stores. 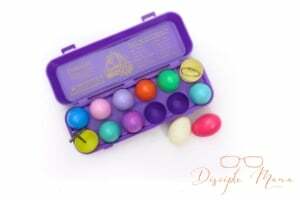 We haven’t tried them yet, because we just received them recently, but someone kindly gifted us with a set of these Family Life Resurrection Eggs. We’re going to add these eggs to our little home Easter egg hunt, and as our kids open them (they’re color-coded so we can open them in order), we’ll tell them the story. Of course you can use the resurrection eggs without an egg hunt, just open them up and tell the story. You can do it advent calendar style (one egg per day leading up to Easter), or you can do it all at once. Alternatively, ditch the eggs altogether and just find some little figurines to help you tell the story more visually. Yes, this is a recipe, but it will work best if you work on it together as a family. 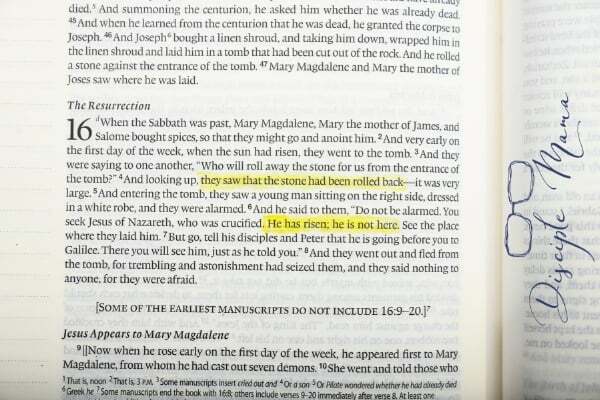 These rolls are a nice treat, AND a great way to illustrate the story of Mary finding an empty tomb where Jesus had been laid. Wrap a marshmallow (which represents Jesus) in dough, then bake–the marshmallow melts, creating a yummy sauce, and leaves the roll (the tomb) empty when you open it up (roll away the stone). Here’s the empty tomb roll recipe from Oh, Sweet Basil that I used. Try it out! My kids loved it, and my husband and I didn’t have any complaints, either. It’s hard to talk to very young children about Jesus’ death in a way that makes any sense to them. Death isn’t easy for anyone to understand, and its finality makes it extremely foreign to most children. My kids haven’t experienced the death of a close friend or loved one, and simply explaining death doesn’t really sink in very well. Jesus’ death is even more abstract in their minds for many reasons. They need to hear it, though, and like so many other things, they will understand it more and more as they grow and learn. It may be tempting to gloss over the crucifixion story with your young children, but I would recommend against it. Now, please understand that I’m not advocating for enlightening your three year old with the details of being nailed to a cross. But tell them that it happened. Tell them that Jesus died. Tell them it was terrible. Tell them that it hurt. Cry with them if you need to, it’s okay. But whatever you do, don’t end the story there–not with your little ones. Always, always, always follow up that horribly sad, terrible story with the best news that a person can possibly hear–Jesus is alive! He rose again. He emerged victorious from the grave and one day, so will everyone who died believing in Him. 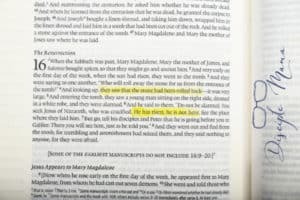 Of course you can read the Easter account to your kids from the Bible, and that will work best with an easy-t0-understand translation. For older kids, I would definitely recommend reading straight from the Bible. If your kids aren’t ready to hear it straight from the Bible, read from whatever Children’s Bible or story books you have (but please check books for biblical accuracy before you read them aloud to your kids!). 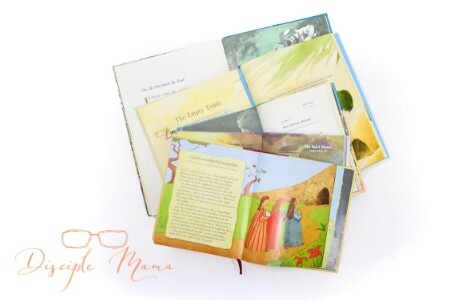 We love the Jesus Storybook Bible, by Sally Lloyd-Jones, and the appropriate chapters from that book will be one way we share the Easter story with our little guys. Please don’t wait until Easter rolls around once a year to talk to your kids about Jesus’ death and resurrection. They can’t really know Christ until they know what He has done for them. The significance of His death and then His defeat of it is everything. That makes sense, doesn’t it? So point your kids often to Jesus’ life, death, and resurrection. Don’t save it for Easter, but teach them to be respectful of and grateful for His sacrifice every single day. Spend this Easter with Jesus! Whether you’ll be with a large group of family or friends, attending a service, or simply at home for the day, you can spend Easter with Jesus. Egg hunts are fun and bunnies are cute, chocolate is lovely and brunch is fabulous, but this year have a Christ-centered Easter and put the focus squarely on the One who died for us. 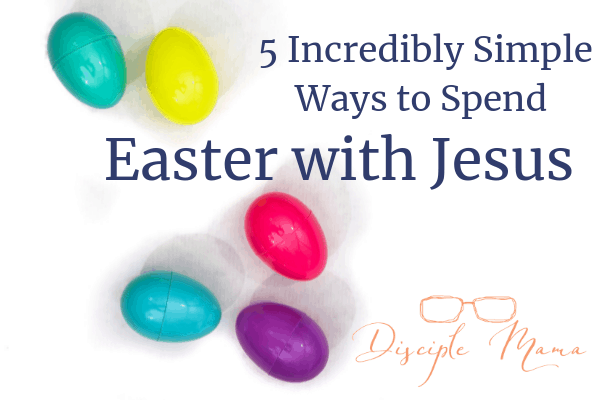 Start now to help your kids cut through the noise of all the Easter brouhaha so that no matter what is going on around them, they’ll know that our Savior is the real reason we have something to celebrate.